The Brilliance Design Team has done it again! 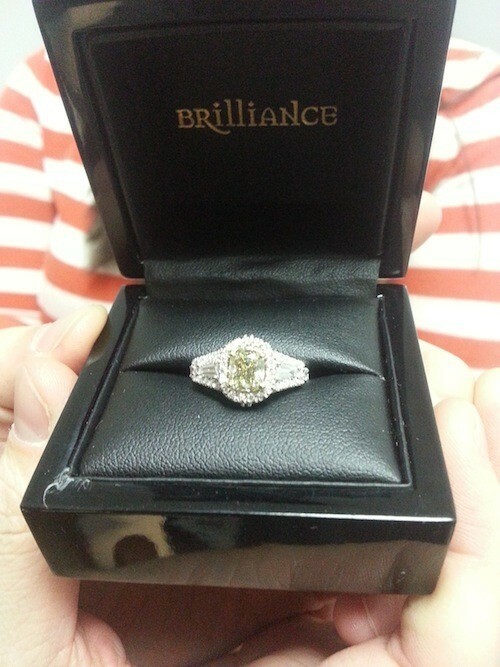 This time around they helped Lane create a beautiful ring featuring a 1.02 Carat Cushion, Fancy Yellow, VS1, GIA-certified diamond surrounded by a beautiful round diamond halo and flanked by two tapered baguettes and additional round diamonds, with two hidden green emeralds in the gallery set in 14K Yellow Gold prongs (to highlight the fancy color) and a 14K White Gold ring with elegant filigree detail. Given his profession as a CAD design instructor, Lane made the design process easy for the Brilliance Team, giving great changes and understanding the physics of ring design. Everyone here truly enjoyed working with him on his design! What about the proposal? Well, he had that figured out, too. We’ll just let him tell you all about it. 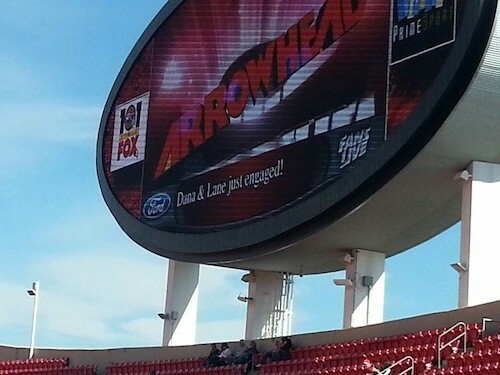 “First of all… THE RING LOOKS AMAZING!!! And Dana was in tears (probably not just because of the beautiful ring) when I presented it to her. On Friday after I received the ring via FedEx, I was so excited about actually holding the ring in my hand that I had your company create for my future fiancé that I couldn’t wait to give it to her. 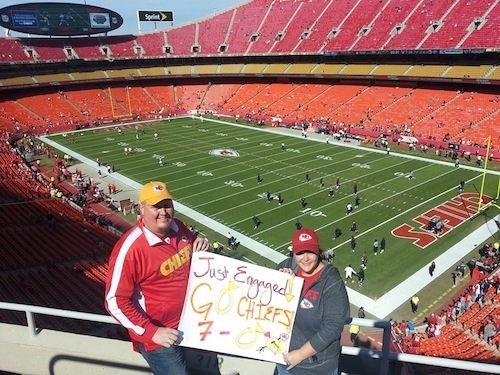 The original plan was to hold off asking Dana to marry me until Saturday evening at a social function we were both attending during the Missouri State University homecoming weekend. But I couldn’t wait and I gave the ring to Dana on Friday night instead. After I received the ring, I contacted Dana and asked her if she would like to go to dinner at her favorite sushi restaurant, and she, of course, said yes. 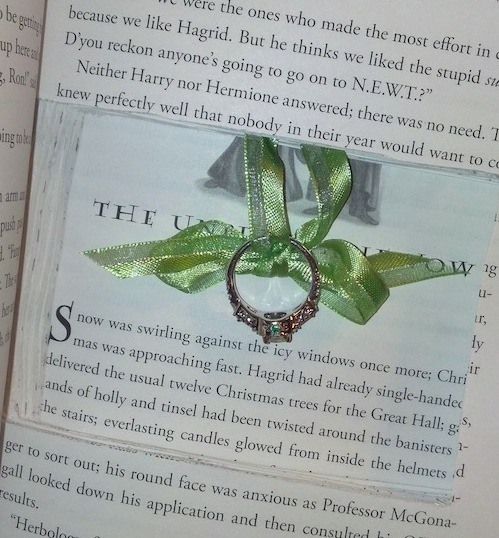 I had a few hours before dinner so I went to Barnes and Nobel and purchased Dana’s favorite Harry Potter book and proceeded to hollow out the book to the Chapter “The Unbreakable Vow”. (NOTE: This wasn’t my idea… I can thank the internet for this one, but Dana is a huge book fan and Harry Potter fan!) 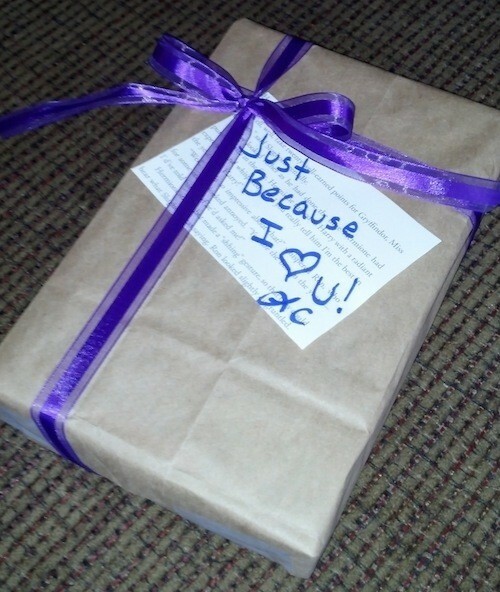 With a ribbon, I tied the ring inside the book and then wrapped the book in brown craft paper to present it to Dana at dinner. Dana had just told me that (mainly because I was digging for the information by asking loaded questions) she was missing that specific Harry Potter book which worked out perfectly to have an excuse to give her a book as an impromptu gift. Once we sat at our table, I made an excuse to run out to my car and grab something that I forgot and returned with the wrapped book. Dana was surprised to be getting a gift and wanted to know what it was for. I just told her that she was having a hectic week and needed something to cheer her up. She proceeded to un-wrap the gift and discovered that it was the Harry Potter book that she was missing from her collection and then thanked me for being so thoughtful. THEN… Like many people do when they hold a book in their hands, she fanned through the book… AND that is when she found the ring! I truly wish that I had a camera of that moment because Dana’s breath was taken away when she realized what she was looking at AND she started crying tears of joy at the same time. After she untied the ring from the ribbon I took the ring and placed it on her hand and asked her to marry me… She of course said YES! Dana knew that I was working with a company online to purchase a ring… But I had just told her a few days prior that it wasn’t working out and that I was going to pursue a different source for buying an engagement ring. So I was successful at setting the stage for a complete MISDIRECTION about when Dana would get a ring and we would be officially engaged. 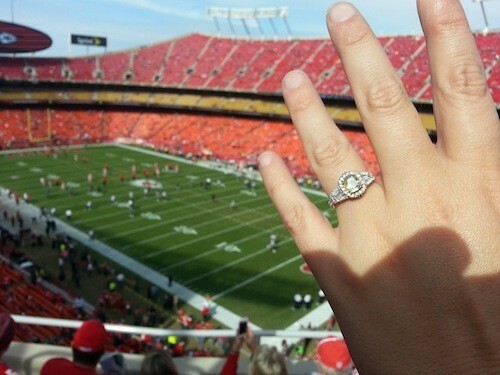 She was truly taken aback by the surprise of the ring… And when the surprise factor went away, she was awestruck by the awesomeness of the ring that was presented to her. 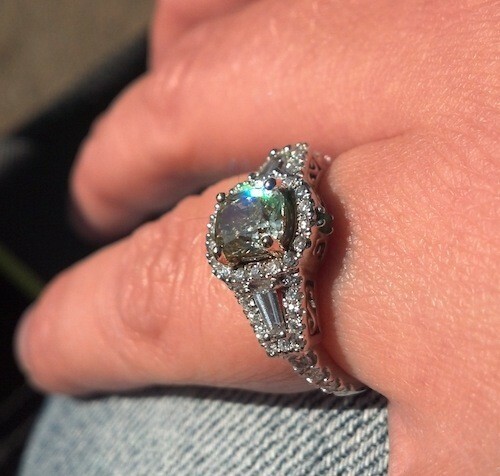 The center diamond was the perfect color and shape… The design of the ring matched exactly what she was looking for… The details of the ring were amazing… And the emeralds put a smile on her face as they are her favorite color! All in all… The experience was great! The “looking” phase… The “design” phase… The “finished product”! ALL MET OR EXCEEDED MY EXPECTATIONS!!! Thank you for providing a full-service to my engagement ring shopping experience… You and the custom engagement ring made my proposal worth every penny and more importantly worth every memory. What an amazing experience! Dana, you found yourself a keeper! Congratulations, Dana and Lane! It was so much fun being a part of your engagement! We wish you all the best. If you have any ideas for custom engagement rings, or you just want to make a beautiful ring to assist with an awesome proposal like this, give us a call to get the process started at (866) 737-0754.